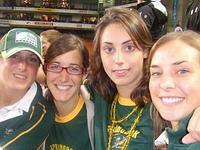 Alyssa says "I would gladly write up the incredible victory that South Africa is still relishing! Too bad for the English, we have a couple of down-and-out English folk out here sulking a bit! We watched the final in a small town outside of Cape Town, at a steak and chips charity dinner under a huge tent with big screens to watch the game, where there were 600 South Africans downing Brandy and Coke, and our British volunteer, Tom stood on his chair and sang ‘God Save the Queen’ at the top of his lungs!" I don’t know whether our pre-departure advice mentions to English volunteers that standing on a chair in a room full of South Africans and singing ‘God Save the Queen’ before a big rugby match as possibly not the safest thing to do, but Tom apparently survived the experience.